The YongHeGong, Lama Temple consists of a large Collection of Wooden Halls and Pavilions intermixed with Gardens, located inside their own red surrounding Wall in an elongated section of Land found in the far North of the DongCheng District. Along the Western Wall of the Temple Complex runs YongHeGong Dajie', a major boulevard which runs south to north and meets up at the North-West corner of YongHegong with the 2nd Ring Road running west to east. The YongHeGong is the largest and only Lamasery, a Temple of Tibetan Buddhism-Lamaism in China's Capital City of Beijing. Built in the Year 1694 AD, during the Reign of the Kangxi Emperor of the Qing Dynasty, it was formerly an Imperial Mansion located in the far North-East of the the exclusive upperclass Dongcheng District. 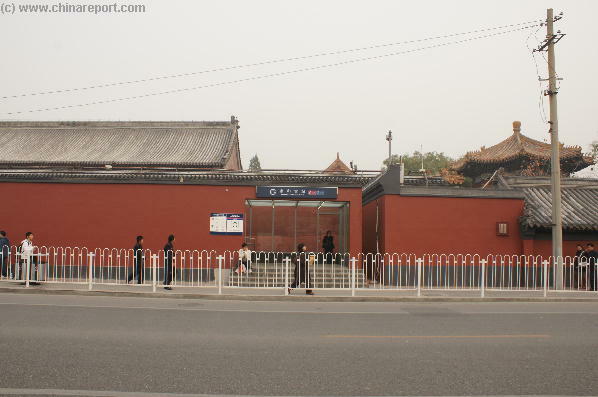 A View of the inconspicuous but important Entrance to the new YongHeGong - Lama Temple Subway Station, about halfway the Lama Temple Complex on YongHeGong Dajie' (Avenue). As can bee seen from YongHeGong Dajie' there are Five Main Buildings inside the Temple, each consecutive one higher than the former. The architectural styles of the Halls are mixed, with styles from Han Culture, as well as completely Mongolian and Tibetan feautures.The Last and Highest Hall is the Wanfu Pavilion, the home of the 18 Meter Tall Nanmu Wooden Buddha described in the 1910 Guiness Book of World Records. North of the Wanfu Pavilion the YongHeGong ends at its enclosing Wall afterwhich follows the second ring road. To Find out More about the History and Cultural Importance of the Lama Temple click through to the Next Page. Bicycles, small trucks and cars buzz by on and around the 2nd Ring Road just North of YongHeGong - Lama Temple. 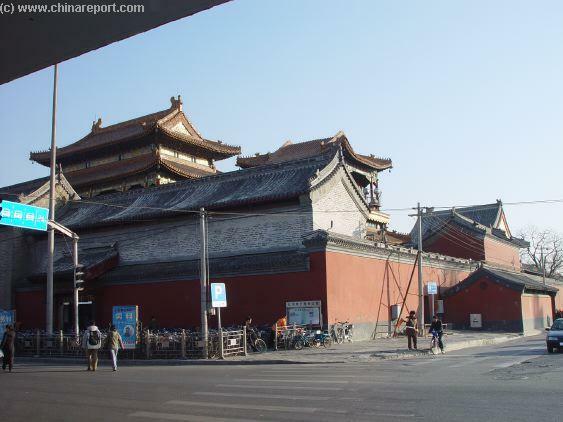 The North-West Corner of YongHeGong - Lama Temple. 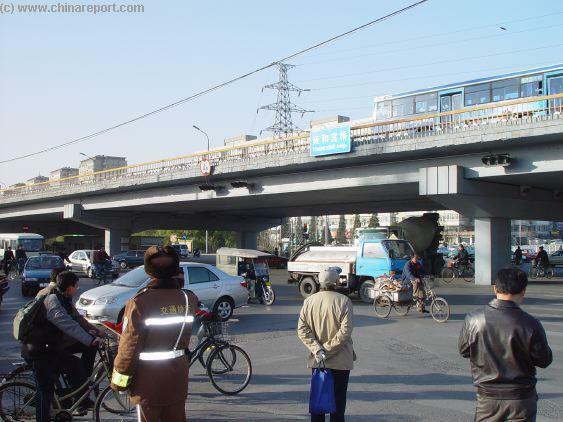 Bicyclists and Cars await their turn at the intersection of YongHeGong Dajie' and 2nd Ring Road. Cars line up on YongHeGong Dajie'(Avenue), as they do every day Alongside the Road are multiple litle stores selling Buddhist Parafernelia for Use at the Temple, or elsehwere. was donated in its entirety to a Buddhist Sect, after which its function changed and it was turned into a Buddhist-Lamaist Temple and the semi-home of Tibetan and Mongolian Culture in Beijing. At the Time many 100's of Tibetan and Mongolian Monks lived inside of the Complex. The most noteworthy and significant historic fact about the Beijing Lama Temple is that it is is the Home of one of Two Golden Vases, which were decreed vital to the establishment of the order of the Dalai and Panchen Lama's by the Qing Dynasty Emperor Qianlong. The Vase, still kept by the Lama Temple of Beijing is the one used to decide the matter of the reincarnation of the next Panchen Lama, whereas the one belonging to Jokjang Temple in Lhasa, Tibet is used in the rituals for deciding upon the next Dalai Lama. 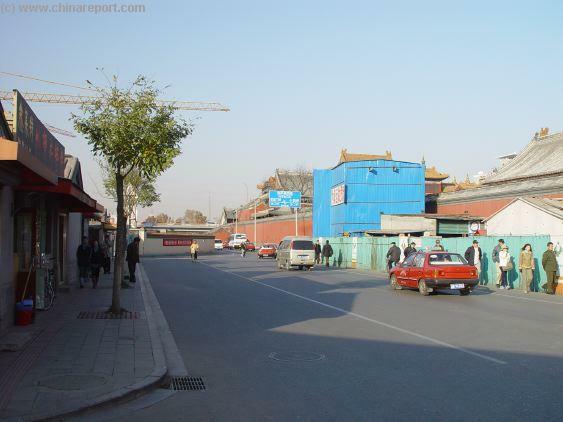 Find the colorful wooden Pailou across from the Gate to YongHeGong Lama Tempe, Turn right (West) into GuoziJian Road and head towards the Gates of Confucius Temple and adjacent Imperial Academy (Photos November 2007). An aerial view of the YongHeGong clearly showing the 2nd Ring Road North of the Temple. Inside of the Wooden Pailou Arched Gate at GuoZiJian Road. 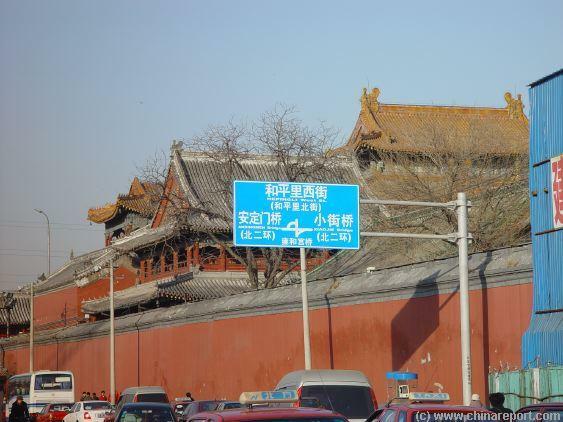 Beijing's massive Ming Dynasty Era City Walls, however these have been demolished in the 1950's to make way for the path of the 2nd Ring Road of the City, a busy highway.Effectively the YongHeGong Lama Temple is enclosed by either roads, or adjacent housing (to the South), to which lately a subway station extension has been added. 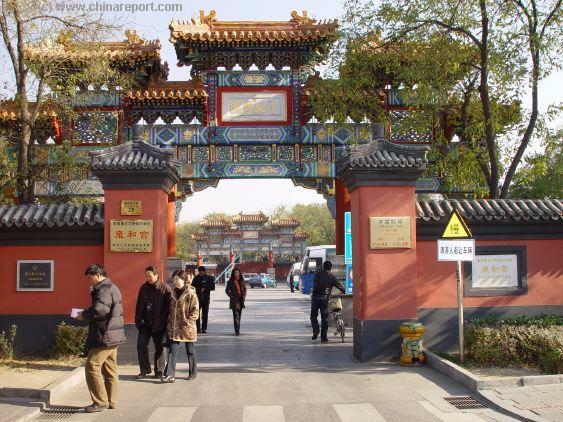 To find the YongHeGong, one must first Travel to YongHeGong Dajie' after which one can enter the Temple Complex and Parking Space through a Gate located on the Eastern Side of this busy road. There is an abundance of things to see and do in the vicinity of the YongHeGong which is why a proper introduction and Tour should include a discussion of YongHeGong Dajie' and the other historic sites in the nearby area. 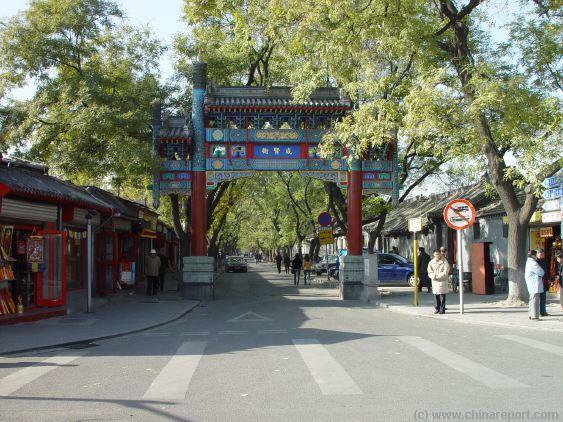 To start with, just East of the YongHeGong stand the Confucius Temple and its neighboring twin, the Imperial Academy. These complexes, currently united under the Flag of The Capital Museum, are the remnants of the Imperial High School of Confucian thought, the passing of who's exams would give access to the highest rank within the Imperial Administrations. 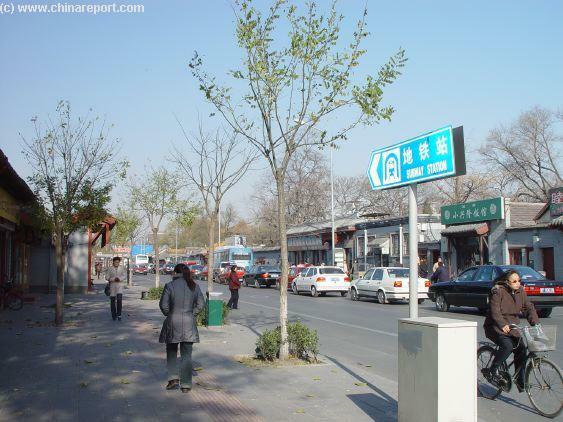 Both locations are very worthwhile a visit and are within easy walking distance along GuoziJian Road. 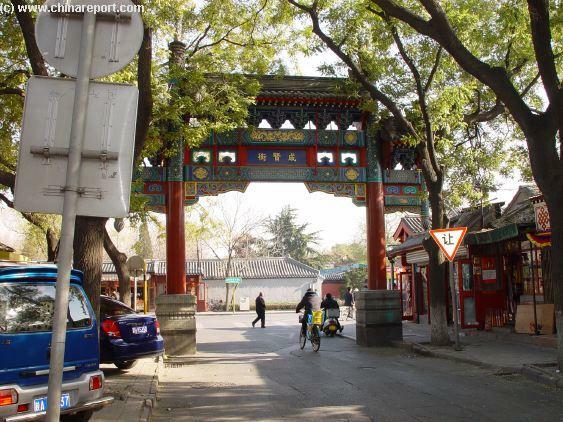 This road can be found across from the main entrance to YongHeGong, marked by a Colorful Wooden Pailou Gate or Arch, a rare item in the City Landscape. own private cab and directing it to this famous destination is no longer necessary. By Virtue of a Large Scale Review of the Cities' Public Transportation System, the easiest method of getting there now leads by Subway/Metro. Blue Circular Line, or make use of the new Green North-South Line which has a station and exit immediatly North of the YongHeGong Complex Gate. This new station and exit came available only in November 2007, greatly easing travel to this otherwise remote corner of the district. The new Green Subway Line and Station under construction at YongHeGong's Western Flank in November 2004 AD. such as pillow sets for prayers, elaborate incense burning vessels or even whole Temple Statues. Whether one is buying or not, the small shops offer a bazaar-like athmosphere that certainly enhances the experience of a trip to the Tibetan Cultural Zone of the City. So, don't miss out by heading straight for the Temple Gate ! Head further North along YongHeGong Dajie' to get a better view of the Roofs of the various Temple Structures and Pavilions. The angle of view offered by walking this way along the Boulevard gives a unique opportunity to appreciate the eleborate architecture of the Temple Complex Buildings. The various courtyard's inside the Temple give spectacular views as well, however due to the elongated and rather narrowshape of the Temple Grounds, some of the scale of the achievements is lost. The Main Pavilions of the YongHeGong Lamasery as seen from YongHeGong Dajie'. 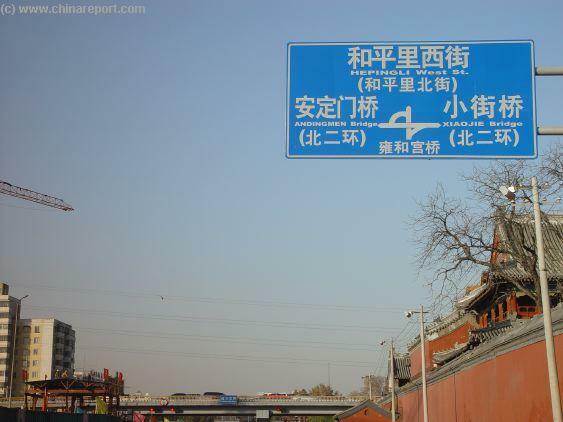 2nd Ring Road destinations, Left and West to AndingMen City Gate (restored remnants) or Right and East to XiaoJie Bridge. 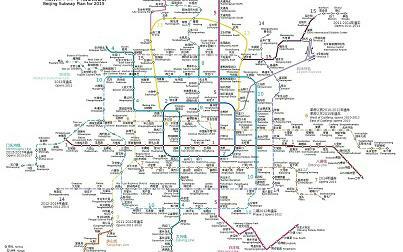 Next station on the subway Northward is Hepingli. Here at the second ring it is often a busy, noisy and chaotic affair, however it is quite worth your while to head across the road and pass beneath the main elevated artery of the second ring road. From there, across the road, one gets a great view of the Wanfu Pavilion with its Magnificent Yellow Tiles. Its adnex tower, colorfully decorated in gold and with bells from its roofcorners clearly has Tibetan styled features. Tibetans as a measure of political control after a failed uprising against Chinese Over Rule in 1792 AD, the Vases remain of great symbolic and thus political value in the highly disputed matter of The Tibet Autonomous Region and the Tibetan Ethnic Minority. Today, the YongHeGong is one of the most visited of the Minor Monuments and Temples in the City. Apart from being an active Temple, it also serves as a sort of museum, being the home several unique Buddhist relics as well as a record-breaking 18 meter high nanmu wooden statue of the Buddha. As a former Palace of the Imperial Family it further offers a stunning and unique architecture. 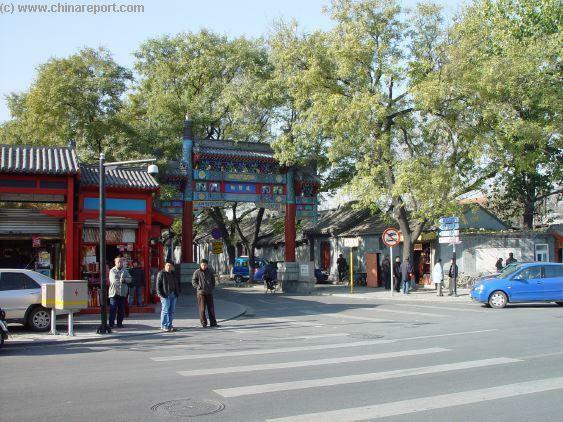 According to some the YongHeGong is Beijing's most colorful and architecturally unique Temples. Hence, YongHeGong is a regular stop on most Guided Tours of the City. 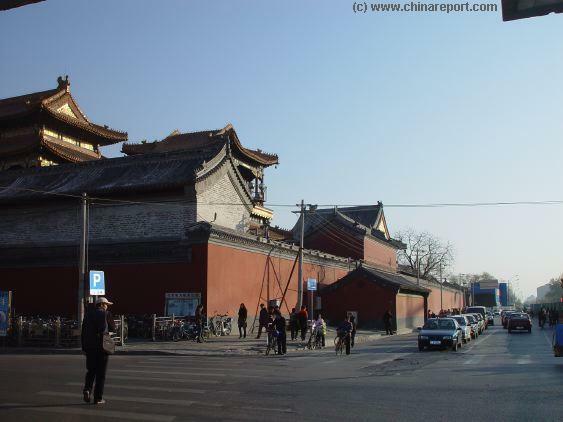 These Pages and offer an armchair Tour of the Historic YongHegong Temple in Beijing, as well as an introduction to the nearby monuments to visit, things to try, see and do and sights to see ! The Report and Tour begins at YongHeGong Dajie', through which the Temple and Former Palace must be entered. best Tour of the Confucius Temple and adjacent Imperial Academy, both institutions of vital historic importance as well as significant architectural Treasures by themselves. To find them - CLICK HERE - for all the details and photos. busses delivering masses of chattering tour groups to the ticket office beyond. Opening Hours of the Lama Temple are 9 AM to 16:00 PM during high season from March through September. Opening Hours are shorter off-season, in winters. 11 AM to 3 PM from November to March 1st. Admission (2007 Season) is 25 Yuan (RMB), or 12 Yuan for Students. 2004 Edition Ticket to the YongHeGong Lamasery of Beijing.